Your home is your greatest investment and we want to help you safeguard its value. 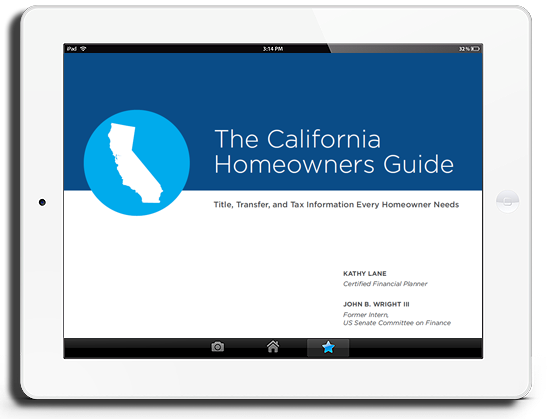 The California Homeowners Guide provides simple and easy-to-read instruction on the different ways to title and transfer your property, shows you how to calculate your property taxes and, best of all, how to save money on your property tax bill every year. Are you leaving your money on the table every tax season? The California Homeowners Guide can make it easy to maximize your property tax savings. Check out our state-wide tax forms. Our user-friendly forms prompt you for simple completion of the tax forms applicable to real property in your county. All you need to know is where you live! The California Homeowners Guide was authored by John Wright, Mary Wright, and Kathy Lane. We are committed to providing easy access to title and property tax information for all Californians. There are things you should know before you take title to your new or next home. We can help with that. Our team will consistently monitor and respond to your requests for information and support. We are always just an email away. Want to read the Guide on your mobile device? Download it from our site at any time. Need to send the Guide to another one of your devices? Not a problem. Use the Guide anywhere and everywhere, and any way you like. Along with 24-hour support, the Team will provide consistent updates to the Guide and re-releases of the tax forms that are hosted on the site.